When it comes to a Crankshaft Seal and Wear Sleeve Installers, we've got you covered. Don’t let using the wrong tools turn into a major repair. We wouldn't risk installation, so why should you? 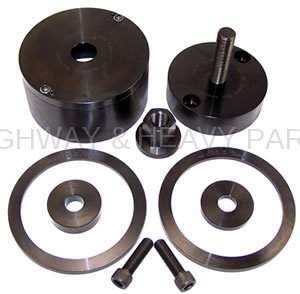 HHP only sells Crankshaft Seal and Wear Sleeve Installers that are manufactured in a state of the art facility using top of the line machining and measuring equipment to ensure each part is manufactured to OEM specifications. Combine this with with up to 50% off OEM prices, a limited lifetime warranty and technical expertise from HHP’s certified staff, and you’ve got a quality Crankshaft Seal and Wear Sleeve Installer that will keep you running for another million miles. Get a brand new Detroit Diesel Series 60 Crankshaft Seal and Wear Sleeve Installer to complete your installation. Protect your engine by preventing wear sleeve lip flare by using our low-priced installation tools. This kit has everything you need to install your crank's wear sleeves and seals with instructions included. Rest assured knowing each part is Built to OEM Specifications and you'll get equal or better quality compared to the OE. Heating up the new wear sleeves and cooling the crankshaft can make installation easier.